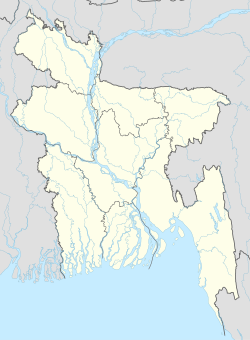 Katiadi (Bengali: কটিয়াদি) is an Upazila of Kishoreganj District in the Division of Dhaka, Bangladesh. Katiadi has an area of 219.22 square kilometres (84.64 sq mi). Katiadi Upazila is the largest upazila of Kishoreganj district, with an area of 219.22 km2. It is bounded by Kishoreganj Sadar and Karimganj Upazilas on the north, Belabo and Monohardi upazilas on the south, Nikli and Bajitpur upazilas on the east, and Pakundia Upazila on the west. Purushbadhia, Doba and Reksa Beels are notable. As of the 1991 Bangladesh census, Katiadi had a population of 264,501, across 49,488 households. Males constituted 50.24% of the population and females 49.76%. The number of adults over the age of 18 is 125,001. Katiadi had an average literacy rate of 20.3% (7+ years), compared to the national average of 32.4%. Abdul Wahab Ainuddin is the chairman of Katiadi Upuzila. Katiadi thana became an upazila in 1983. Kaitadi Upazila has only pourosova katiadi and 9 union parishads named Lohajuri, JalalPur, Achmita, Bonogram, Mosua, Momurdia, Chandopur, Duldia, korgaong, 95 mouzas and 151 villages. Katiadi was declared a pourosova in 1999. This page was last edited on 1 February 2019, at 06:25 (UTC).